Normally, I highlight innovations that I am genuinely excited about, but this is one that I am not only uncertain about, but might seriously question the intelligence of including on a motorcycle. Anyone who has ever driven a car know that, because of the positioning of the roof pillars and mirrors, a typical car has serious blind spots from the driver's seat. To compensate, a driver should turn their head to look over their shoulders and check their blind spots before executing lane change and turning maneuvers. However, as Americans have gotten pudgier and their necks ever less nimble, the physical requirements of the shoulder check have become too demanding and automakers have compensated with the addition of Blind Spot Monitor technology. Using sensors or cameras, cars are now able to monitor the blind spot area and provide both a visual and audible warning if a vehicle is detected. If the driver signals a lane change, the system will actively warn against a maneuver if a vehicle is present in the blind spot. The problem is the sheer number of people who could get around an entire day's worth of driving without checking their mirrors once or ever using a turn signal is downright staggering. For these people, no blind spot monitoring system in the world will ever be enough. So in their infinite wisdom, BMW has decided to add such a system as an option on their C650 maxi-scooter. Called Side View Assist, it uses sensors embedded around the bike to detect objects up to 15 feet away and lights built into the mirror stalks to warn a rider when another vehicle is detected. There are a few caveats, however. First, the system is only able to function from between about 17 mph up to about 50mph. Second, it only works when the vehicle has a maximum speed differential of about 6 mph. That severely limits the functionality of the system and makes me wonder why anyone would even bother. On a motorcycle, there really are not the same kinds of blind spots as on a car. A quick shoulder check is much easier to do because of both the riding position and the lack of pillars to block visibility. While it might have a disclaimer to the contrary, such systems inevitably promote laziness and encourage drivers to be less aware of their surroundings, relying on the technology to avoid accidents. When you are in a two-ton steel cage, the consequences are generally not so dire. On a motorcycle, the consequences are liable to get you killed. To say the least, this is one innovation from the automotive world that I hope never makes any serious inroads into motorcycling. Riders who cannot be bothered to monitor their surroundings should not be riding in the first place. 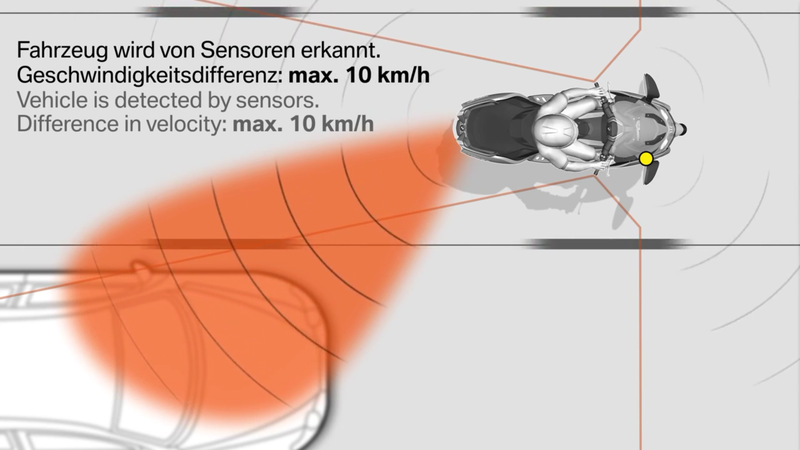 To learn more about how BMW's Side View Assist system works, check out this video at http://www.autoblog.com/2015/09/22/bmw-c650-scooter-side-view-assist-video/.